Manila is full of unique contradictions – ultra-modern and historic; local and international; glamour and poverty. Even though Manila usually serves as no more than a stepping stone to one’s vacation, the city itself offers a wealth of fun and adventure. Manila is also a base for many exciting day tours you’d otherwise miss. Our travel agency offers plenty of tours and packages to meet your personal preferences, and adjusted to fit your schedule. Pick one of our pre-made packages featured below, or build your own Manila tour package package with our help. All packages include transportation, hotels and guided tours. We’ve carefully created a handful of tour packages, certain to leave you wishing you had more time in Manila. All packages include airport pickup or transfers (for travelling outside manila), as well as your choice of hotel. We can also provide a personal tour guide if requested. If you need our expert advice, we give it for free. Contact us and we will assist you in choosing the right tours to make your vacation perfect. Whether your trip is of a romantic or adventuristic nature, a family trip or solo, we will create the best you can get. If you feel that these pre-made packages aren’t suitable for you, you can easily create your own by adding any of the items in our catalog to your wishlist. Combining the packages above with other destinations is highly recommended. By doing so you can save money, time and effort. Alternatively you can just book one of our full vacation itineraries and let us plan your whole trip to the Philippines. There are over a thousand hotels in the city, ranging from budget hostels to luxury 5 star hotels. We chose to work with only a handful of establishments, which we believe are most likely to meet your standards. Our connection with each hotel allows us to step in and assist should any problems occur during your stay, as well as give you the best hotel deals. The quality of your Manila holiday can vary a lot, and staying in the right hotels has a major effect on it. From budget hotels to all-inclusive ones there really is no guarantee of quality when it comes to the Philippines, but with our service you can be sure you will get exactly what you wished for. We have the best collection of affordable accommodation that will surely match your standards and requirements. Our catalog showcases a selection of hotels perfect for your honeymoon, group or family trip, and else, for different budgets. Our experts have personally reviewed all hotels shown on this page. Browse through our catalog and add the ones you like most to your cart, or contact us for recommendation. Capital : Manila city (1,780,148 pop.). Metro Manila (13M pop.) is one of the most populous urban areas in the world. Flights : NAIA airport is the country’s busiest airport and the main gateway for local and international flights. Its 4 terminals are quite far from one another and require a drive through the busy city traffic. Please keep that in mind before planning any connecting flights, and consult with us first. Ferry : There are ferries to and from all major cities and nearby destinations via Manila south harbor. Manila bay is one of the best ports in the country so traveling by ferry is a good option. Getting around : Getting around in this chaotic city and its congested traffic can prove a challenge, even for locals. We plan your itinerary accordingly, so you don’t waste your time in Manila stuck in traffic jams. Best time to visit : Summer is between late March to June, but the best months are January and February when it is still cooler and less humid. Nightlife : The big city is teeming with bars, restaurants and nightclubs that go all night long. Main areas are Makati, Malate and Quezon City – but there are also great spots in Pasig and Taguig. Speak to us first and get some free advice – your safety and enjoyment are our priority. Local festivals and holidays : Manila is so culturally and ethnically diverse, that one can find festivities all through the year. Parades held during Christian holidays and the Chinese New Year are the most popular. We offer a wide variety of day tours within Manila and nearby sites. This vibrant city has a lot to offer and we carefully planned our offers to give you a taste of the Filipino hospitality and culture. All tours are available for couples, families and even solo travelers. We can provide a private guide but we encourage joining our groups tours to make new friends along the way and to save costs. Many of the these are suitable for people on an overnight stay as well, so your short time in Manila will be an experience you won’t forget. Simply add any of these tours to your cart, and we will include it in your package. If there is anything you’d like to do and can’t find in our list of services, just contact us. We will add it into your package, offer some free advice and help with any necessary arrangements. Intramuros is one of the most popular points of interest in Manila – the old fort founded by the Spaniards upon their arrival to the Philippines. Although largely destroyed during WW2, a walk around the old city’s walls is still a great way to see and learn about Manila’s complex history and culture. Fort Santiago, the headquarters of Spanish occupation, is now a small museum attributed to the national hero José Rizal, who was incarcerated there prior to his execution. Other notable landmarks include the San Agustín Church – an ancient religious complex housing a collection of precious relics and works of art; The Manila Cathedral – one of the city’s prominent religious sites, first built in 1581; and Casa Manila – the oldest building in the entire city and a great showcase of historic Filipino-Hispanic architecture. A guided tour of Intramuros is a very popular way to fully understand not only this specific compound’s history, but also the beginning of the most influential period of the Filipino culture. You can choose between a walking tour, a kalesa ride (a horse drawn carriage), or a bike tour. Any of these option will grant you a deeper insight, which is hard to achieve on your own. Not far from Intramuros lies Rizal park, also known as Luneta. It serves as Manila’s version of Central park – where couples and families come to relax and watch shows and activities. The park is also home to several historic sites, most notably the Rizal monument, and also offers the beautiful Chinese and Japanese gardens. The National museum is just outside the park – a 2 building complex where the senate used to sit. One building houses the National Museum of Fine Arts , while another holds the Anthropology and Natural History museums. They all offer a great chance to quench your thirst for knowledge, and learn about the land and its people. Across the Pasig river, is where you will find Binondo – the world’s oldest Chinatown. It is a great place to witness a unique blend of Chinese and Filipino heritage. The Binondo church is a great example of Manila’s cultural mix, with a truly unique Pagoda bell tower. Other Chinatown attractions include the Chinese cemetery – an ancient graveyard for those who were denied burial during the Spanish era. The site is home to truly fascinating tombstones and some truly extravagant ones as well – some tombs here even have a Jacuzzi installed inside. The Bahay tsinoy museum is a great way to wrap up your day and learn about the deep influence Chinese have had on Filipino culture and history. The main reason to visit Chinatown however, is its one of a kind culinary offering. Influenced heavily by the Hong-Kong style kitchen, the food here is so good you’d never want to stop eating. Take our Chinatown food tour , try all the favorite local delicacies and learn how to make them yourself. It’s worthwhile to book both this tour and the Intramuros one on the same day, but be prepared for a long and active day. All three of these locations (Rizal Park, the National Museum and Binondo) make a great addition to Intramuros and very packed day. If you’d like to spend some time at any of these places, we’ll coordinate it with your driver, or even supply a guide for the entire tour if needed. Manila is also a shopping mecca with 3 of the 10 biggest shopping malls in the world – SM Mall of Asia, SM Mega Mall, and SM City North Edsa. You can find thousands of branded products at much cheaper prices, or just hang out and explore the mall. Mall of Asia is especially recommended, especially if you are traveling with children. it offers cinemas, arcades, food courts, ice-skating ring and a small amusement park. It’s also very close to Manila Ocean Park, a very impressive aquarium. Here, you will find many marine species and enjoy different activities and programs. a great, fun and educational place for kids and kids at heart. All of the tours in this section can be done either as day tours or as a short one or two night’s vacation. It is really up to you to decide. If you don’t have a lot of time, and are prepared for an intensive day trip that starts early in the morning and ends at night, pick the day tour option. If you’d like to take your time, book the overnight tour package and experience each spot to its fullest, without tiring yourself out too much. Subic bay is the local’s favorite when it comes to weekend getaways from the city. Merely a 3.5 hours bus drive from Manila, Subic is filled with luxury resorts overlooking the marvelous bay. The 2 main attractions here are the Ocean Adventure (788P for adult, 628 for senior or child), where you can swim with dolphins and watch aquatic shows, and the Zoobic Safari (695P adult, 595P child) – a one of a kind safari that allows you to feed all of its animals, including the tigers. Subic is also famous for offering some of the best wreck diving sites in all of Asia, with varying difficulties – so it’s a great place to learn how to dive. There are plenty of high quality all-inclusive resorts, for affordable prices. If you are looking for a place to have a nice dinner, go and eat in one of the high-end resorts, even if you’re not staying there, as the best restaurants are owned by them. There is a selection of bars you can check out at night, but they aren’t the most family friendly, so keep that in mind if you’re traveling with kids. Mount Pinatubo, whose latest eruption in 1991 was the 2nd largest terrestrial eruption of the 20th century is also near Manila. You can still witness the aftermath to this day, as the eruption changed the landscape considerably. Molten lava destroyed the old summit and created a crater. Rain waters filled the crater and formed one of the Philippines’ most picturesque landscape – the Pinatubo Lake/Crater. The way to the lake is by a 4×4 vehicle and then a 30 minutes long trek, and you can either join a group or book your own private tour. If you always dreamed of flying in a helicopter, Pinatubo is the best place for you to do so. It’s more expensive (as prices start at 1600$ for three people), but it’s a once in a life time experience. The Pinatubo helicopter tour leaves from Manila, and include a Manila Bay sightseeing tour for no additional charge. 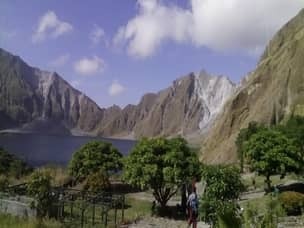 You can read here about day tours to Mt.Pinatubo and book the one which you like best. Another popular destination is Tagatay – 2.5 hours’ drive to the south of Manila. The higher altitude allows for much cooler weather, but more importantly provides some breathtaking scenery. Located across the Tagatay ridge is the People’s Park in the Sky, designed to be a mansion for former infamous president Ferdinand Marcos. It now serves as a public park and offers a remarkable vantage point of Tagatay. 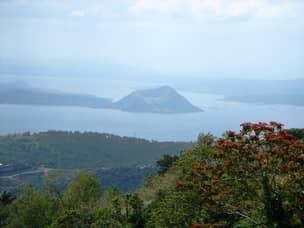 Viewed from Tagatay ridge is Taal Volcano Island – an active volcano located at the middle of Taal Lake. The boat to the volcano island takes roughly 30 minutes, and then another hour is needed if you wish to trek your way to the top. You could always do some horseback riding if you feel you don’t want to walk. do some horseback riding if you feel you don’t want to walk. You can get to Tagaytay by bus, and it’s probably the best option for those who wish to spend a night there. If your’e on a tight schedule, take a private van instead, since Manila traffic can really mess up your itinerary otherwise. Corregidor Island is one of the most important historical places in the Philippines and makes a great day trip from Manila. The tour starts at 07:00am and ends at 04:00pm, so it fits in most schedules. You can also spend a night or two on the island, depending on your itinerary and interests. This island was a battlefield during WW2 – between American and Philippine forces and the Imperial Japanese Army. Today the whole island serves as a monument for those who sacrificed their lives on it. Still, the island offers a very relaxed and quiet atmosphere, and that’s why it’s a perfect break from the city. The Philippines is a country blessed with countless breathtaking beaches. Even though the best beaches aren’t in Manila’s vicinity, there are still plenty of gorgeous beaches to visit. Even if you don’t have enough time to travel to the famous islands, you don’t have to miss out. If you enjoy diving, both Batangas and Puerto Galera are among the best diving destinations in the country, as they are both located in the epicenter of the Coral Triangle. Batangas and Puerto Galera are destinations very close to Manila. The drive to Batangas is around 3 hours and in order to get to Puerto Galera you’ll need to take an hour long ferry ride. Batangas is better if you can only go on a day tour in that sense, as it’s faster to get to and from on the same day. Puerto Galera is a another hour away, and the last ferry back leaves at 3:30 pm, so a day tour would be a bit tight. It’s better to stay there for at least a night if you have the time. Puerto Galera’s beach is considered better than most beaches in Batangas. Not only that the beach and its surroundings are prettier, there are more foreign tourists there, and therefore many more bars, restaurants and parties. All in all the atmosphere is much more lively. If you can spend a night on your short trip out of Manila Puerto Galera is the place to go. There are many different beaches in Batangas for you to choose from. If you are interested in prestigious resorts, Laiya Beach is considered to have the best all-inclusive resorts in Manila’s area, and is frequently visited by the rich and famous of the city. They are so popular that it’s highly advised to book a few months in advance. On the other hand, Anilao’s dive resorts offer excellent accommodation for lower prices, and are the perfect place for a quick dive retreat not far from Manila. How does Manila fit into your travel plan? Most tourists tend to overlook Manila and regard it as only a stop on their way to dreamy islands. Since you will be there no matter what, or even if you’re in town for a short while, why not make the most out of it? We offer tailor made Manila tour packages, guaranteed to meet your expectations and leave you wishing you had more time to spend in the city. 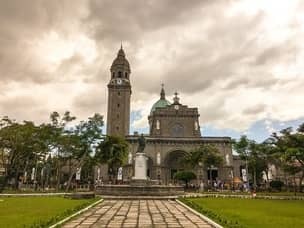 On top of that, Manila is also the jump off point to many destinations, and by running away from this city you are going to miss out on them. The Banaue Rice Terraces and Vigan City are two places that will give you a taste of the inland Philippines, meeting indigenous people and getting to know their culture. Combine these destinations with a Manila package in order to maximize your time in the city. Interested in tagaytay and/ or beach near by. Solo female traveler will want to sightsee and walk. Can you offer options for transfers and or tours. Yes we can! but price depends on the dates as well as a few other factors. Can you please contact us through here and we’ll get back to you with an offer. 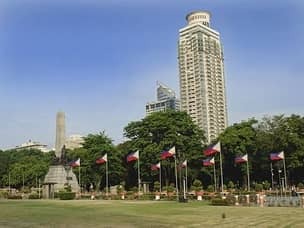 Planning for a half day Manila City tour (Intramuros) for private group of 12 pax on Saturday 30/3/2019 starting at 1:30pm. Kindly quote with details. Or you can just mail us with a specific request and we’ll do our best to accommodate it.